Pretty much ever since the Hobbit movies were announced, fans have clamored for an ultimate box set that gathered the (then-future) extended editions of those films with the extended Lord of the Rings cuts in a single box set. Well, you’ll soon be able to—and it’s pretty spectacular. 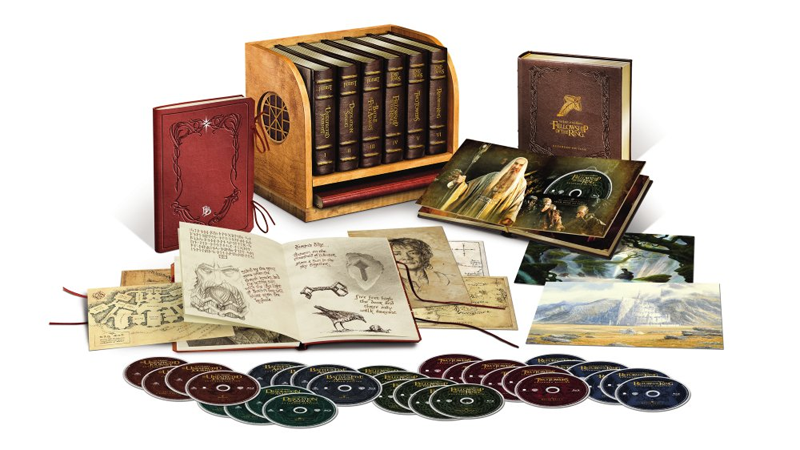 Emerging out of an Amazon.com listing today, the “Middle-Earth Limited Collector’s Edition” features a whopping 30 Blu-ray discs of footage: Extended cuts of An Unexpected Journey, Desolation of Smaug, Battle of the Five Armies, Fellowship of the Ring, Two Towers, and Return of the King, and all of the previously released and monstrously extensive behind-the-scenes documentaries that were included in past extended edition releases. On top of that, each movie is wrapped up in its own faux-leather-wrapped book case, which themselves sit on an elaborate wooden shelf—hilariously described in the official release as “crafted from solid wood with a design selected by Peter Jackson.” If that wasn’t enough, the collection also comes with a recreation of the Red Book of Westmarch—the book Bilbo and Frodo “wrote” The Hobbit and Lord of the Rings in—filled with pages of official concept art, as well as individual recreations of concept art from the films by Alan Lee and John Howe. It’s certainly an elaborate collection (even moreso than perhaps people might have expected from the first time these movies are gathered in a single bumper collection) and it might be an expensive one. Amazon.com has since removed pricing details from the product, but it was initially posted with an $800 price tag for an October 4th release. That’s yet to be confirmed—we’ll update this post as soon as a price is officially known—but it seems a bit crazy, even for as grand a set as this is.